MasterBind, the premium brand in document finish solution present the classic black hard cover binding channels. These classic book spine creates an elegant and stylish notebook or project. Miss-match and personalize the covers a wide range of spine colors like black, navy, burgundy and white. 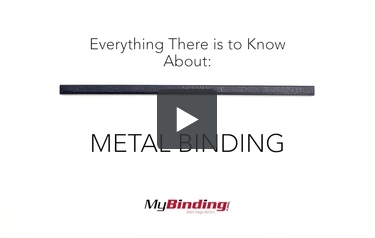 MasterBind Hard Cover Binding Channels are also available in 5mm, 10mm, 13mm, 16mm, 20mm, 24mm, 28mm, and 33mm handling sheet capacity of up to 300 pages! Design, create and finish your project with the Classic Black MasterBind Hard Cover Binding Channels. What machine will I need to bind with these metal spines?